Our new partner school Academia Tica is situated in the beautiful coastal city of Jacó Beach which will undoubtedly give your language course a tropical touch and make it a truly memorable experience. 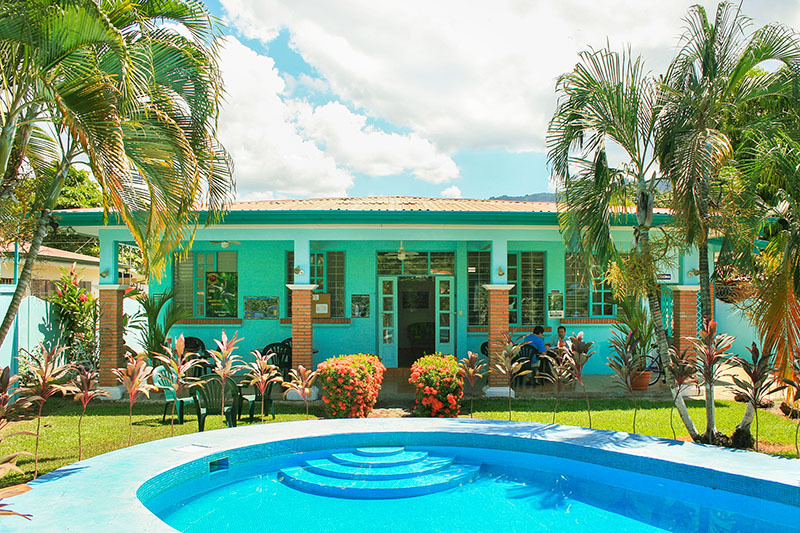 This charming language school is situated in a quiet neighbourhood and is surrounded by cafés, restaurants and shops. The beautiful beach is only 15 minutes walking away. High quality education with fully qualified language teachers, who are specially educated in Spanish as a foreign language. 4 fully equipped and air conditioned classrooms. After school, you will have the fantastic opportunity to discover the unique and stunning surroundings and the local environment by for example Mountain Bike. The area of Jaco Beach is very popular and is a great place to do water sports like surfing or kayaking. The beautiful surfing beaches, like Playa Hermosa or Playa Escondida are just a few minutes away. The mini-group course consists of 20 lessons per week in classes of no more than 6 students. This course is given in 6 different levels and has a minimum duration of 1 week. If there are no other students in your class at your level, automatically your lessons will be changed into a fewer amount of individual lessons. The price stated here is for an airport transfer upon arrival (only possible between 06.00 and 19.00 hours). If you have booked an aiport transfer, you need to arrive before 19.30 at the airport. If you arrive after 19.30 hours you need to book the “Late arrival package” for € 185 which includes: transfer to a nearby hotel, one night at the hotel, breakfast and transfer to Jacó. In 2019 the school is closed on: from 01/01/2019 until 06/01/2019, 11/04/2019, 18/04/2019, 19/04/2019, 01/05/2019, 25/07/2019, 02/08/2019, 15/08/2019, and from 21/12/2019 until 05/01/2020. One-to-one lessons will be rescheduled, group lessons will not. The teaching materials can be borrowed without additional cost. Students can also buy the book (optional) for € 30 to be paid directly at the school. This course is in addition to the mini-group course and consists of 5 or 10 individual lessons per week. During these hours you can decide what you would like to discuss, for example topics that suit your profession or topics which you are interested in. 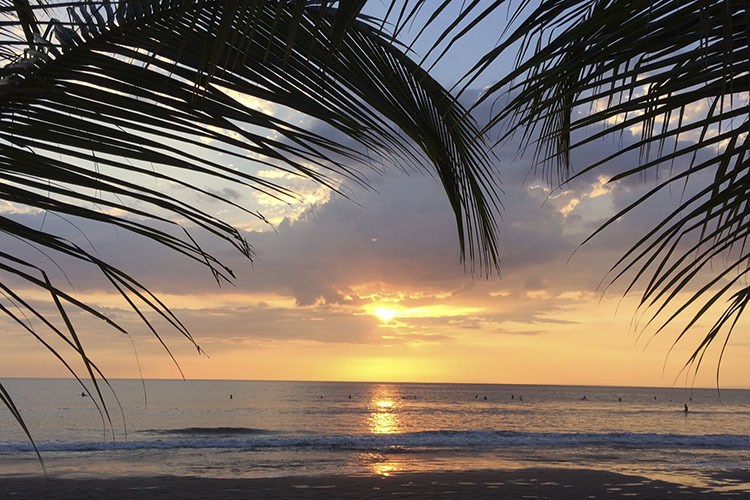 Jaco Beach is also known as the surf city of Costa Rica. An ideal destination to combine your Spanish language course with surfing lessons. The Spanish & Surf course consists of 20 lessons of Spanish per week and 3 surfing lessons. The time schedule depends on the weather and the waves. Surfing lessons are around 2 hours of duration and include all the necessary equipment. The lessons are taught by top-notch surf teachers from an experienced partner school in Jacó Beach. As you are the only student in this class, the program of this course will be adapted to suit your knowledge, interests and profession. It will also be done at your own pace and to suit your level of language and understanding. There are many shared apartments in the residential complex and every apartment has 2 bedrooms. You can choose either your own single room or a shared double room. You share the living room, bathroom and kitchen with your roommate. You also share 2 washing machines with 3 other apartments. The complex is situated 3 blocks away from the school and 4 blocks away from the beach and it is surrounded by many different restaurants, bars, internet cafés, bus stops and shops. You will be staying at one of our carefully selected host families in a single or double room, based on half board. The family will do your laundry for you once a week. Most families live within a walking distance from the school. Costa Rica: a land of beautiful landscapes and an incredible diversity of flora en fauna, a tropical climate and the most hostile people! I truly experienced the “PURA VIDA” feeling here during my 1 month trip across the country, during which is visited the 2 locations of our partner school Academia Tica in Jacó Beach and (Coronado) San José.